Lightly coat a frying pan with the butter or olive oil of your choice and heat on medium heat. Once the frying pan is hot, toss in the sweet potato cubes, onion, and red pepper. Toss the vegetables around to lightly coat with the butter that's in the pan and sauté, stirring frequently to ensure the vegetables do not burn or stick to the pan. Once the onions and sweet potato begin to soften, add in the garlic, cilantro, and rosemary. Sprinkle in paprika and pepper to your liking and mix well. When the onions caramelize and the sweet potatoes turn soft and begin to brown around the edges, mix in spinach. Continue to sauté until the spinach wilts. Remove the veggies from the frying pan and set aside. Wipe the frying pan clean (or use a different one if you don't mind extra dishes! ), heat up some more butter or oil, and then crack in an egg. Fry the egg on medium-low heat. When the whites of the egg first begin to solidify, dash on a little pepper, paprika, and salt. Flip the egg when the edges start to curl up, and fry the egg on the other side until the yoke reaches your desired consistency. 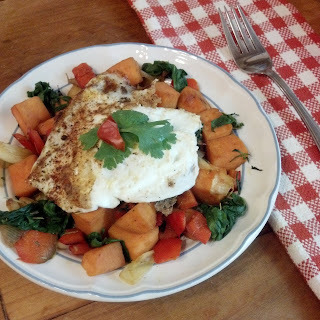 Top the sweet potato vegetable mix with your egg and savor the flavors of this delicious breakfast skillet!